Founded in 1967 by Haki Madhubuti, Third World Press has been a crucial force in the publication of black books. The press has published poems, nonfiction, and novels. The company took the Black Arts imperative of "institution building" quite seriously. The press has published works by some of our most respected and important writers, including Dudley Randall, Hoyt W. Fuller, Gwendolyn Brooks, Amiri Baraka, and many more. The longevity of the press has been quite impressive as well. Third World Press is, as noted on the company site, "the oldest independent publisher of Black thought and literature in the country." 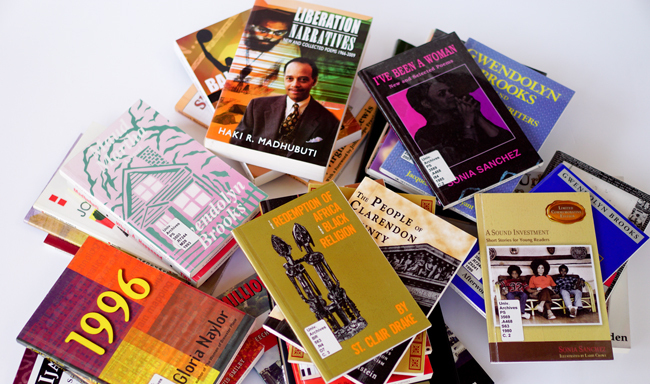 A few years ago, Madhubuti donated nearly the full catalog of Third Press books to the Eugene B. Redmond Collection at SIUE. Seeing all those publications, which were published between 1970 and 2015, was a reminder of how vital the press had been to Black Book History over the last 50 years. It is of great interest that very few Third World Press books get reviewed in so-called African American or Afrocentric journals. Do identify 3 (three) non-black publications that have ever reviewed a Third World Press publication.